Using co-authored publications between China and Korea in Web of Science (WoS) during the one-year period of 2014, we evaluate the government stimulation program for collaboration between China and Korea. In particular, we apply dual approaches, full integer versus fractional counting, to collaborative publications in order to better examine both the patterns and contents of Sino-Korean collaboration networks in terms of individual countries and institutions. We first conduct a semi-automatic network analysis of Sino-Korean publications based on the full-integer counting method, and then compare our categorization with contextual rankings using the fractional technique; routines for fractional counting of WoS data are made available at http://www.leydesdorff.net/software/fraction. 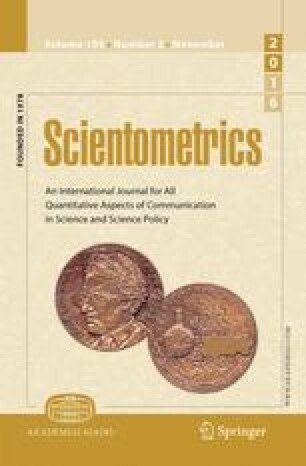 Increasing international collaboration leads paradoxically to lower numbers of publications and citations using fractional counting for performance measurement. However, integer counting is not an appropriate measure for the evaluation of the stimulation of collaborations. Both integer and fractional analytics can be used to identify important countries and institutions, but with other research questions. Galam, S. (2010). Integrating multiple coauthorship in the quantitative evaluation of individual’s scientific records. Arxiv preprint arXiv:1007.3708. Hanneman, R. A., & Riddle, M. (2005). Introduction to social network methods. CA: University of California, Riverside. Retrieved July 1, 2013 from http://faculty.ucr.edu/~hanneman. Mehmood, A., Choi, G. S., & von Feigenblatt, O. F., & Park, H. W. (2016 accepted). Proving ground for social network analysis in the emerging research area “Internet of Things” (IoT). Scientometrics. doi: 10.1007/s11192-016-1931-4. Morris, S. A. (2005). Unified Mathmatical Treatment of Complex Cascaded Bipartite Networks: The Case of Collections of Journal Papers. Oklahoma State University. Retrieved from http://digital.library.okstate.edu/etd/umi-okstate-1334.pdf. Unpublished Ph.D. Thesis. Rana, S. (2012). Bibliometric analysis of output and visibility of science and technology in Singapore during 2000–2009. Webology, 9(1), Article 96. http://www.webology.org/2012/v9n1/a96.html. Tanksalvala, S. (20 October, 2014). Web of Science now includes expanded coverage of top Korean journals. Web of Sceicne. http://endnote.com/blog/web-science-now-includes-expanded-coverage-top-korean-journals. Velez-Cuartas, G., Lucio-Arias, D., & Leydesdorff, L. (2016, forthcoming). Regional and global science: Latin American and Caribbean publications in the SciELO Citation Index and the Web of Science. El Profesional de la Información; preprint at arXiv:1510.02453. Yoon, J. W., & Park. H. W. (2016 Accepted). Triple helix dynamics of South Korea’s innovation system: A network analysis of inter-regional technological collaborations. Quality & Quantity. doi: 10.1007/s11135-016-0346-x.